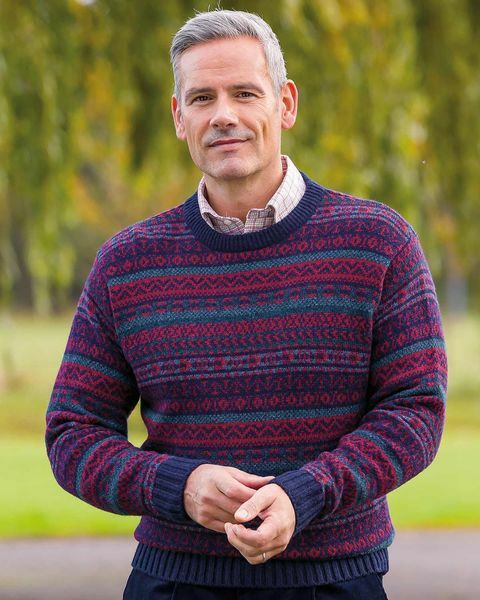 Navy Fairisle Crew Neck Jumper. Sizes S-XXL. Hand Wash Only. Very pleased with the quality and sizing of this product. Good colourways available. Very prompt delivery. Mens Shetland Wool crew neck sweater Knitted in the UK. Crew neck, drop shoulder style. The perfect choice for long autumnal evenings and cold winter days. A great way to keep warm and cosy in an array of co-ordinating colours. "Very pleased with the quality and sizing of this product. Good colourw ..."